...is a concept that is sometimes hard to explain. My students asked me why the money in the Social Security fund is going to run out soon. I went on to explain about Social Security replacement plans and how I had been on other retirement plans for most of my life and therefore did not contribute to Social Security. The other issue is that the government has been taking money from the fund to pay for running the government. 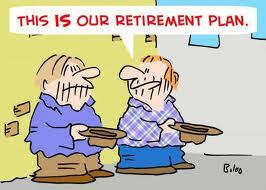 When FDR created social security it was going to be a great thing and insure retirement for all of us. That is no longer true. Another issue is that our population is actually decreasing. The baby boom was from 1945 to 1964 and since then we have not had any increases in our population. In fact if it was not for the illegal foreign workers (right now at about 12 million) we would have had a huge decrease in our population. Less population equals less people contributing to the plan. I told them about Iowa when I was growing up that we had a county farm. Farmers would sign their farms over to the county and then move to the county farm to retire. It gave them a place to live and it allowed them to continue to work in a farming environment. Total security for the rest of their life. It was located in the local community so the residents could continue their local relationships. The same community along with their life long church and friendships. In my community in Iowa they now have an assisted living facility, Sunny View, where people can remain near home in their final years. A few miles away is Friendship Haven where people can retire in a much larger community. The question I could not answer for my students was what would the government the state and local government do with the thousands of people who will retire soon and not have any social security income. When I tried to explain 401K plans, IRAs and Keogh plans I got a blank stare. The students and apparently not their parents have given any of that any thought. As a side note we were talking about how there is an excessive number of housing units today. Housing that cannot be sold and some think will never be sold. If that continues maybe the government could buy those homes and give them to retirees. A very prominent economist yesterday said that the housing market will not correct itself for at least ten years. Banks were set up to sell financing and mortgages and not to own homes and to manage property. What a dilemma. Just start planning today because you will not be able to rely on Social Security tomorrow.